In the British Forces, collar badges are worn as lapel badges on formal uniforms and are often called 'collar dogs'. 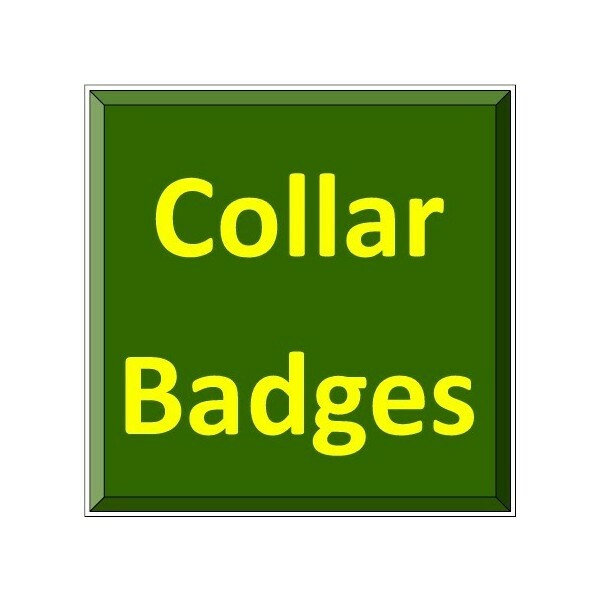 Our collar badges are sold as single items; where they are worn as part of a facing pair these are denoted FL (Facing Left) or FR (Facing Right). In otherwords, if you want a set for a uniform, you need to order one FL and one FR. The FL and FR badges have different Stock Serial Numbers. - pairs are not always in stock. - most of our clients are collectors who usually want only one example of each, not a pair. These are often called 'collar dogs'. Otherwise known as Staybrite, (alternative spellings Sta-Brite or Staybright), we abbreviate Anodised Aluminium to A/A on our lists. Anodising is an electro-plating process resulting in lightweight shiny badge. The main colours used are gold and silver. Staybrite replaced brass and white metal as the main metal for British Other Ranks' military insignia from 1951 onwards. Collar badges were not generally worn on Battle-Dress by Other Ranks - this meant that few Staybrite collar badges were produced until more formal uniforms were re-introduced several years later. This section of our website deals specifically with Staybrite (Anodised Aluminium) collar badges. We have Royal Air Force and non-UK Air Force insignia for sale. Branch collar badge are worn on uniform as lapel badges and are often called collar dogs. In some cases (mainly those collar badges with a design including animals, e.g. eagles), the collar badges are made in 'facing pairs' - this is so that RAF eagle collar badges both face rearwards when worn. Police insignia - collar badges for sale. Fire Brigade collar badge insignia.